A Murderer Is Walking Free! How And Why, Is What I Want To Know? Look at the face of that young man, Trayvon Martin, the first thoughts that comes to my mind are not threatening, hoodlum, or gang member. He just looks like a nice kid and by all accounts, he was. But he's dead now. Killed by the hand of George Zimmerman, a neighborhood crime watch volunteer. So who is this George Zimmerman anyway? Well, here's a little of what we know. He may be the neighborhood crime watch volunteer but he also has an allegation of domestic abuse in his past; that makes me question if he has anger management problems. What I do know is a 13 year old is dead, George Zimmerman is the shooter, so why is he still walking the street? By the way, George Zimmerman also attended college with dreams of being a law enforcement officer. Did that make him simply overzealous? Another thing we know about George is in 2005, he was accused twice of either criminal misconduct or violence. This guy was a neighborhood crime watch volunteer, in a gated community, who neighbors say took his job quite seriously. He made 46 calls to the police to report disturbances, break-ins, suspicious characters and other incidents.George Zimmerman has a number of defenders though, many say he was only concerned with the safety and the welfare of his community. What concerns me is a 17 year old kid dead, there doesn't appear to be any valid reason why, and the killer is still walking the street. Does this make any sense to you? Is it a racial thing? Well, if you're white most likely you'll say no, and if you're a minority most likely you'll say yes. I grew up in a culturally diverse city and I saw with my own two eyes the ineqality and the two seperate worlds that minorities and white people lived in. I saw it with my own two eyes so that qualifies me to speak on it. Think about it. If the tables were turned and this kid was white, trust me, someone would be in jail right now. All that is known is that on February 26th, George Zimmerman called the police to report Trayvon as "suspicious", he used what was at first believed to be a racial slur, but on the 9-1-1 call he was heard saying "these a$$_ _ _ _ _ always get away." The 9-1-1 operator advises George to not follow the kid. He continues to follow him anyway, and the next thing you hear is someone yelling help, gunshots, Trayvon is shot dead, and George Zimmerman claims self defence. Yet, Trayton had no weapon, only candy, and ice tea. Finally, finally, finally, this kid may get justice but I'm sure it will be little comfort to a family who has needlessly lost their son. The Department of Justice, the FBI and finally a Grand Jury will be investigating this incident in Sanford, Florida. 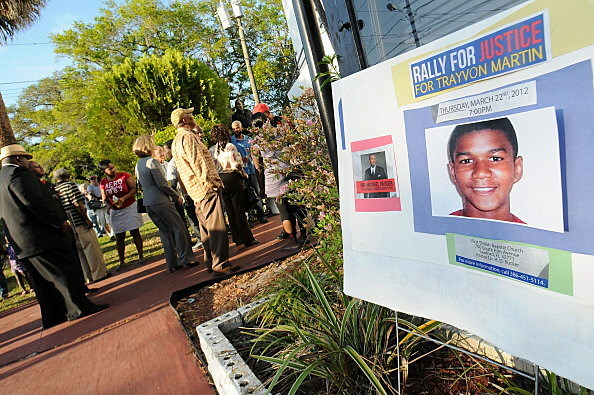 Why local police refused to do anything about this since February is a disgrace and dishonor to Trayvon and his family. Too bad it took three departments to do what one should have done close to 4 weeks ago, get a killer off the street, and finally bring justice to a kid who was unarmed, and murdered one evening in February.